Sport climbing outside can be intimidating. It’s not comfortable to leave the controlled gym environment and the upward tug of the top-rope behind in favor of leading a climb and clipping into the wall as you go. But just a few simple steps will get you feeling confident and stoked on everything sport climbing has to offer. 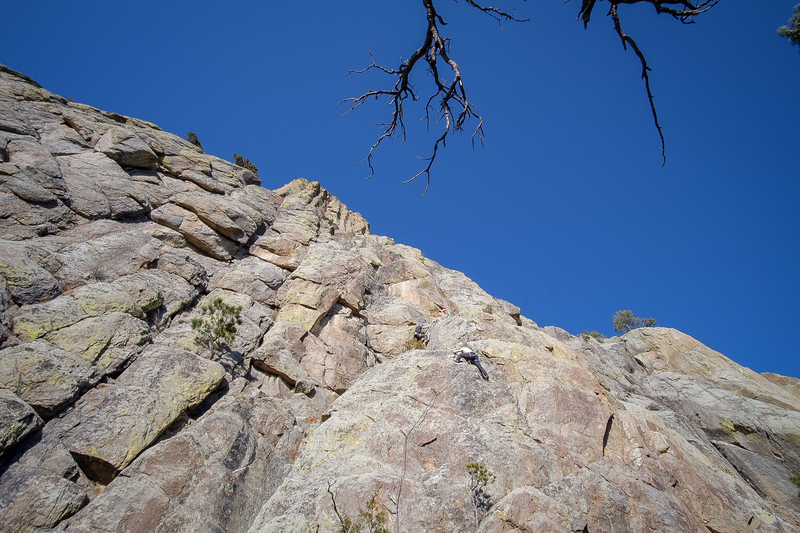 Editor’s note: This story details the experience of one climber. It does not provide specific recommendations on climbing technique, anchor building, or rope management. To learn more detailed rock climbing techniques, consult a professional guide. I grew up visiting climbing gyms about once a year with my family, often climbing in tennis shoes. In college, I started gym climbing more regularly, mostly bouldering (climbing short walls above pads with no rope) and auto-belays (devices that let you climb up a wall, then catch you and slowly let you down to the ground if you fall). As my skill level and interest in rock climbing increased, I started getting the itch to do more. My coworkers at GearJunkie got me hooked on the idea of learning the ropes of sport climbing. 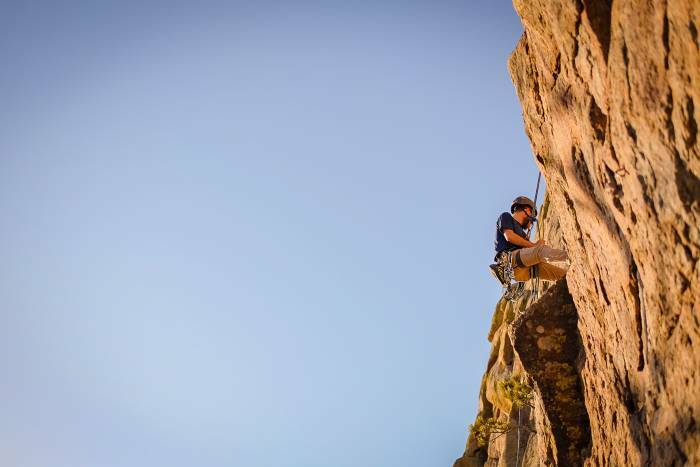 Sport climbing is a type of rock climbing that requires you to clip your rope into fixed bolts in the rock as you climb. It’s a common form of climbing and requires less gear than traditional climbing. The climber is belayed by a partner below and uses the fixed bolts for periodic protection along the route. Because the climber is not on a top-rope, falling is more consequential — they will fall beyond the last bolt that was clipped. 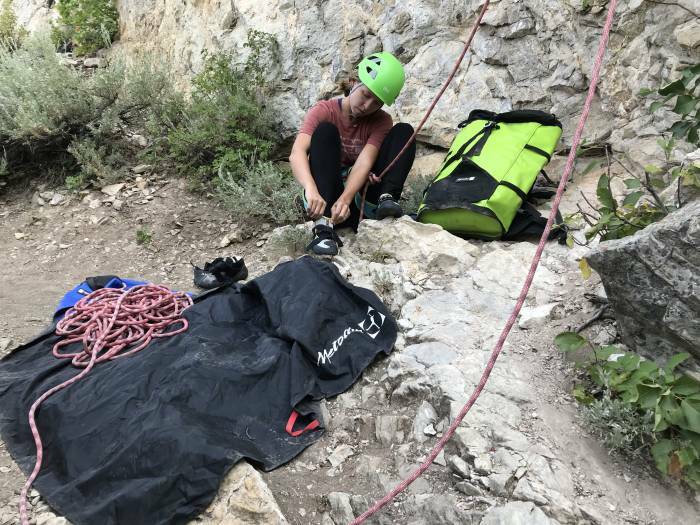 One of the biggest upsides of sport climbing is its accessibility: Many crags have sport climbing routes, and the setup is simple and quick. My wife also enjoys climbing, so we both decided to learn how to sport climb so that we could be each other’s lifetime belay partners. Though it may seem simple and intuitive, here are the steps we took to enable us to confidently lead outdoor sport climbs with our own gear. First-time climbers shouldn’t jump straight to sport climbing. First, get comfortable climbing walls via top-rope, auto-belay, or bouldering. A climbing gym is a perfect place to practice proper climbing technique and develop the necessary strength and stamina to scale tall walls. Increase your skill level by attempting harder routes and watching others climb. Sport climbing is more difficult and scary than climbing on top-rope. You’ll want to build a solid climbing foundation before giving it a try. Plus, some climbing gyms require you to climb a 5.10 route on the first attempt before you can take a basic sport climbing course. Most climbing gyms have a plethora of courses available, from basic climbing technique to Sport Climbing 101. At our local gym, we signed up for Sport Climbing Basics, a course that was offered regularly. It cost $45 per person and covered the gym’s entrance fee and any rental gear needed. We loved our course. The instructor taught us common sport climbing terms and proper techniques for belaying, clipping quickdraws, falling, catching a fall, rope management, and more. Plus, he warned us of common mistakes and taught us how to avoid them. At the end of the course, we were certified to sport climb in that gym so we could continue practicing our new skill. We even stayed after the class to keep practicing while the teaching was fresh in our minds. Some sport climbing courses cover the basics for indoor sport climbing only, where you don’t have to place your own quickdraws and where there’s no need to clean your anchor. 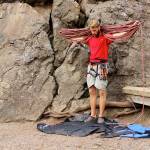 Other courses are more comprehensive and better prepare you for outdoor sport climbing on your own. Ours was a simpler course, and instead of paying for the next course up, we took our basic knowledge and went outdoor climbing with some climber friends to round out our training. My coworkers are avid climbers and jumped at the chance to hit the crag together. 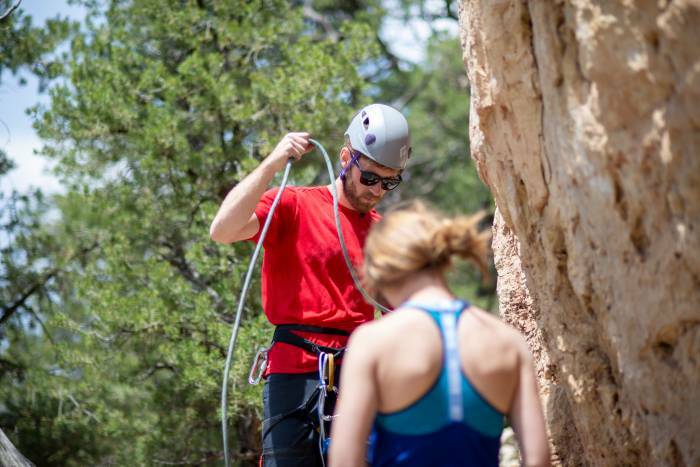 Because sport climbing outside is such a different experience, we first climbed while our skilled friends belayed us. Then, I belayed my wife while our friends watched closely and gave pointers. The whole experience was a major confidence builder and left us feeling comfortable with climbing on lead in an outdoor setting. Plus, because our gym course didn’t cover cleaning a route, our friends thoroughly taught us the process and watched as we continually set and cleaned our anchors. I’m not going to outline the intricacies of anchor building in this article because there are countless setups depending on the anchors available. To learn how to build anchors, I strongly recommend taking a guided course or learning from experts. Another bonus was that this experience climbing with friends fueled our stoke for sport climbing. We loved the freedom and the options that our new hobby offered and couldn’t wait to get our own gear and head out on our own. Be sure that the friends you go with are very knowledgeable and skilled before trusting them to help and teach you on the wall. If you don’t have any close climber friends, local climbing gyms are great places to meet belay partners or join group outings. Feeling comfortable and excited about our new sport climbing abilities, we were ready to accumulate our own gear. Climbing gear is expensive and, as beginners, we really only wanted the essentials. By this point, we both had climbing shoes, chalk bags, harnesses, and belay devices — we had become semi-regular gym rats before taking on sport climbing. Finally, we had the gear and were ready to test it out. Again we called upon our climber friends and set up a time to hit the crag. This time, with the supervision of our friends, my wife and I used only our own gear to climb together. This helped us make sure that our climbing kit was what we needed to safely climb on our own. At the recommendation of our friends, we ended up grabbing a few more locking carabiners and runners after our outing. By the end of the day, my wife and I were sport climbing on our own and with our own gear. Our friends were nearby and had watched us for most of the day, checking our knots, watching us set and clean our anchors, inspecting our gear, and observing us belay and climb. This outing again boosted our confidence, and we left knowing that we could now hit the crag by ourselves and climb safely with our own gear. Find a Crag and Climb On! 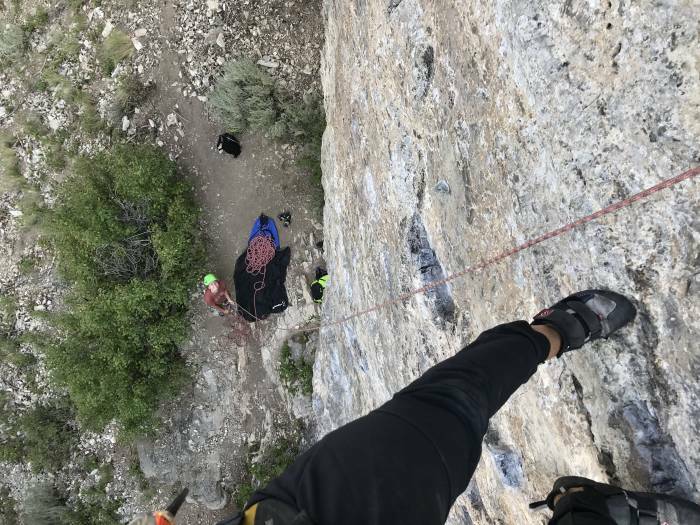 A few weeks later, my wife and I were traveling and found a nearby sport crag on the Mountain Project app. We gathered our gear, found the wall, set up and inspected everything, and talked through our sport climbing process. Once comfortable, we started climbing and had an absolute blast. There are a few different ways to find nearby climbing crags. You can call your local climbing gym and ask for suggestions, you can download and use the Mountain Project app, or you can hire a climbing guide for your area. 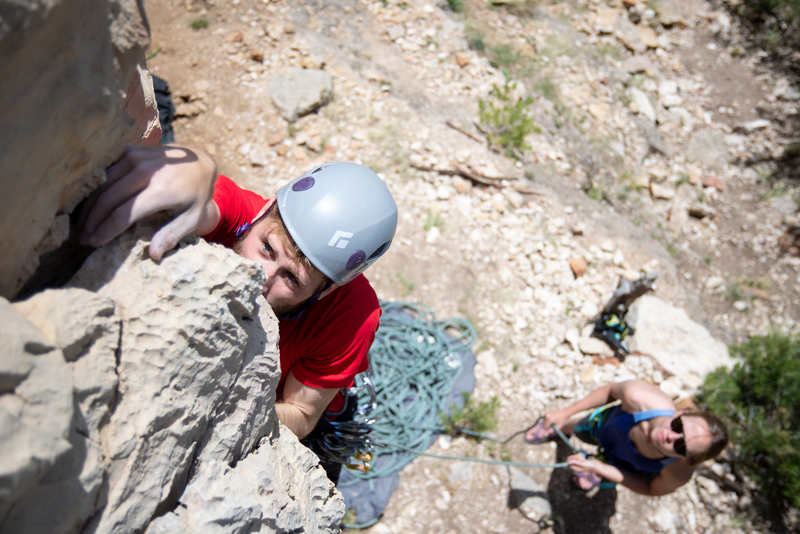 Sport climbing opens up a ton of possibilities and adventure opportunities. Now, when my wife and I get the urge to climb, we don’t have to find a climbing gym and pay entrance fees. We can simply show up to a crag, unload our gear, and climb on. If that freedom sounds good to you, and if you feel stagnant in your current climbing ability, give sport climbing a try. Once you learn it and accumulate the gear, it’s a hobby that’s mostly free, accessible, and downright fun.